Rangers thrashed Dundee winning 4-0! Vicky will be rightly very pleased and proud. "You only sing when you're winning." It's a chant regularly heard at stadiums up and down the country. But how does it feel when your favourite team looks like going an entire league campaign without a victory? That's the prospect facing Dean Walker. The 24-year-old is chairman of the Brechin City Supporters' Club and has watched his side home and away this season. It hasn't been pretty. Twenty nine Scottish Championship games played, four draws, 25 defeats and not one win in sight. A whopping 23 points behind ninth-placed Dumbarton in the table, Brechin's relegation was confirmed on Saturday with a 2-0 loss at Greenock Morton. Brechin have seven league games remaining. No senior football club in the UK has ever gone an entire season without a league win. Is lightning likely to strike over Glebe Park? "Most of the season has been quite funny," Walker tells BBC Scotland. "I've been following Brechin City for as long as I can remember. Going to a game and expecting to get beat, you just have to laugh it off. I still think we can get a win. Brechin were formed in 1906 and, while it hasn't been that long since their supporters celebrated a league victory, last season's dizzy heights of a promotion run via play-off victories over Raith Rovers and Alloa Athletic seem like a distant memory. The supporters' club bus usually takes 20-25 fans to Brechin games home and away. "We've actually played quite well against the higher teams: St Mirren... Dundee United... but it's just trying to get the ball into the back of the net," says Walker. "Going to games it's usually fans with their headphones on and listening to music and having a laugh really. "The humour on the bus is tremendous - we all have a good laugh. They're not all down with their heads in their hands. Vicks wrote: The rumour about Neill Lennon being the next Rangers manager won't go away. If I ever happens, I'm throwing myself in the Clyde. Don't take it seriously, Vicks. That "rumour" has been going around for a while. I think it started on one of the Celtic forums like Kerrydale Street, Green Brigade or Huddleboard just to wind up Rangers fans - last year as an April Fool rings a bell. Such a shame they're too stupid to realise that a successful WUM attempt has to be at least a bit plausible. Do you think Murty will be appointed full-time or would you prefer someone else from outwith the club to take over? It's a huge decision for Rangers, you need to get this one right. Warburton was good at taking you up to the top flight, but out of his depth once there. Pedro - well, what can you say, I think you'd have a good case against him under the Trades Descriptions Act! Murty has the team more organised, playing as a team, knowing what they're doing, but I'm not sure he has the ability to take you to a consistently competitive level. Does he even want the job? [quote="Vicks"]The rumour about Neill Lennon being the next Rangers manager won't go away. The rumour about Neill Lennon being the next Rangers manager won't go away. 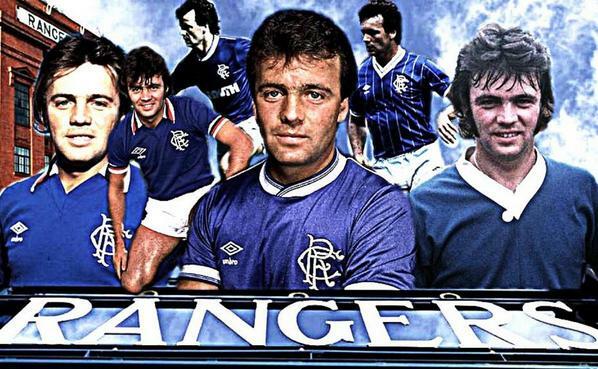 Today is the anniversary of Davie Cooper's death. Coops was only 39 when he died and he was reckoned to be one of the best players Scotland has ever produced. Someone said "He was a Brazilian trapped in a Scotsman's body"
I can mind the night Celtic stopped Rangers winning 10 in a row. Coatbridge is a Celtic stronghold and Rangers fans like me, are well in the minority. Me and my Da went out an hour after the results and Celtic fans were dancing in the streets. We stopped at the traffic lights and a big crowd rushed forward and started bouncing the car up and down. They were obviously expecting us to join in the celebrations. Our last two managers have been disasters. First Mark Warburton turned out to be a snake and then Pedro Caxinho turned out to be insane. I like Graham Murty but if he doesn't get a win against Celtic next month, he needs to go. Alfredo Morelos has signed a new contract at Rangers that will keep him at the club until 2021. Fredo is an excellent player and the SPL's top goal scorer.